In my last post, I shared that getting to know my characters is my favorite part of the writing process. I find one of the most difficult parts of developing characters is picking their names. There are many factors to consider when deciding on a name – the character’s personality, their age and the era they live in. I often end up changing a character’s name several times in the draft writing processes because as I get to know them, I find the name I initially picked for them just doesn’t suit their personality. In my early writing days, I picked a name for a character simply because it was a name I liked or because it sounded pretty. But after a while, it just sort of fell flat. It didn’t fit the character. Now, I take more time in the naming process because I like their names to have meaning, to say something about them, to contribute something to the story. For example, in my previous novel about three generations of women, the last name was particularly important because my three main characters would share it. I chose Winters, taking into consideration the connotations of the word. Winter can be beautiful, yet cold and stark, reflecting the beauty of my protagonist while also depicting her mother’s harshness and lack of maternal instinct. The Social Security Administration – This baby name database from the Social Security Administration lists the top 100 male and female baby names for each decade since the 1880s. Determine when your character was born and, if in the U.S., you can look at top names by decade. This is a great way to find age-appropriate names for your characters. Yearbooks – Blow the dust off your own yearbooks, or visit the local library which might have decades of yearbooks available to search. Another great way to find from the right era. Baby Name Sites – Websites like BabyNames.com are great tools to search for names, their meanings and origins, and reference name lists. Does the meaning of your character’s name reflect their identity or conflict with it? For fun, try the Random Renamer or find an online random name generator! Phone books – If you can still get your hands on a hard copy phone book, open to a random page and pick a name. Or browse until something inspires you. Name Origin Sites – I often spend so much time choosing a character’s first name, I forget to give them a last name. Consider your character’s heritage and family background. I have used this website Behind the Name which allows you to look up surnames by origin and meaning. Newspapers – Scan headlines and newspaper articles to see if a name jumps out at you. As you find names you like, be sure to write them down! 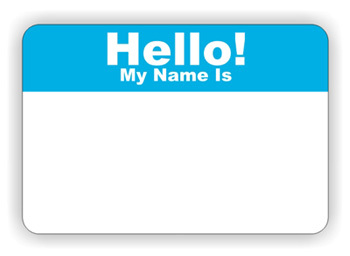 Some other things to think about when naming your characters: Give your character a nickname. Was your character teased in school? Do they despise their full name and instead go for a shorter nickname? Nicknames can be a useful device. In my previous novel, my main character was called Kate by her friends, but her mother only ever referred to her by her full name, Katherine. I used this as a way to portray the distance in their relationship. Be wary of giving central characters similar sounding names or names that start with the same letter. As different as your characters may be, giving them similar names can be confusing for readers. I also try to avoid names that are awkward to pronounce. As a reader, names that are unpronouncable can pull me out of a story. Try saying your characters names outloud to see how they sound. There are, of course, exceptions to every rule. As I plan my NaNo novel, I’m trying to carefully pick the right names for all my characters so I don’t have to change them later on. This entry was tagged Characters, Names, Writing, Writing tips. Bookmark the permalink. I had a similar issue with naming my characters. I have found name generators helpful. I usually list 20-30 names that I think sound good and then say them out loud as I am writing my character description and see how they feel. I find it very useful to do this out loud and, when possible, with someone else. I like the idea of keeping a list of potential names and just trying them out as I write the story. This is challenging. I keep a list of names I like (I teach so run into lots of different names) and then mix them up. The challenge is making sure they’re ethnically accurate. Agreed, making sure names match your character’s ethnicity is huge for maintaining authenticity and your writerly credibility! Another good source is movie credits. Sounds strange, but names for my characters often come to me at unexpected times — when I’m vacuuming the carpet, out for a jog, or sometimes when I’m scribbling down a sketch for a new idea. As I rework my novel, I’ve decided (based on advice from a dear writing friend) to rename one of my main characters, and I’m really struggling. Nothing seems to fit. I cling to the hope that one day it will just come to me. Movie credits – great suggestion!I hope the name comes to you soon!